I’m excited to think that in a few days I’ll be enjoying a wonderful evening at the Eagan Community Center with so many of you at our annual awards banquet. I think everyone will enjoy the buffet, silent auction, awards, door prizes and the highlight of the evening will be our guest speaker Mr. Kenneth Wofford, a Tuskegee Airman. These past few years I’ve tried to make the banquet a little bigger and a little better, but it is getting almost too much for one person to handle. So, if you think it is a wonderful event and like the way it’s been going, please let me know if you would be interested in joining me next year on a banquet committee. At our next monthly meeting on Oct 19th we will hold nominations for chapter president and vice president. We have some very smart and talented members and this is your chance to share those gifts with chapter members, especially the slower less talented members like Peter Denny and myself. (Peter, I’m just kidding about you, but I don’t want to be the only one everybody is pointing at.) In November we will hold elections. Last month I said a few “thank yous” and I’d like to continue by thanking all the members who have made our Young Eagle program such an important part of Chapter 25. Nothing I do for the chapter brings me more happiness than sharing an airplane ride with an excited young aviator. A few years ago John Koser and Jon Cumpton took over a great Y.E. program from Mike Dolan. Now John and Jeff Coffey are doing a wonderful job every month with the help of a good group of pilots like Don Eide, Pete Gavin, Jon Cumpton, Gary Rosch, Mark Kolesar, Norm Tesmar, Frank Hanish, Dan Carroll and yours truly. The ground crew makes everything run smooth and John and Jeff get plenty of help, especially from Ron Oehler, Bill Brown and lately Andy Hutchinson. Thanks to all who are involved in making the Y.E. program such a success. Keep in mind the coordinators are always looking for more pilots and ground crew, so just show up the third Saturday of the month between 9 am and noon at the hangar. Last month I asked for some ideas on what to do with our money in regards to our hangar. The feedback I received from most people was to pay off the hangar loan first and then we can deal with other projects later, so that is what we plan to do (the respondents would not make very good federal government employees-what ever happened to spend, spend, spend?) Speaking of the hangar, I’d like to thank the hangar committee members, Lee Hurry, Bert Sisler, Ron Oehler, Harvey Havir, Ron Hoyt and Bill Brown for making the president’s job a whole lot easier. For your information we plan to have another Christmas party at Dan Carroll’s hangar in December, probably on Sunday the 18th. We will tour an air museum at Anoka Airport first and then go to Dan’s hangar. P.S. We held our banquet last night and I had a wonderful time! I have the feeling that most of our guests enjoyed themselves according to the comments I heard as they were leaving the banquet hall last night. I want to give a special thanks to Ed Hansen for obtaining a number of the door prizes. Some of you may have heard the news, but for those of you who haven’t, I’m going to give up the chapter presidency at the end of the year. It really has been a great ride these past three years, but I think it is time for a change. In this issue and the next few monthly newsletters I’ll try and thank everyone involved in helping me make this a great organization. Another AirVenture has come and gone. WOW, what a wonderful time. I flew over on Wed. morning with John Koser as my human GPS. We had a smooth, uneventful two hour flight until we got close to Ripon and then the airspace got busy and so did we. A few S-turns, some flaps to slow down and listening closely to the radio made for a fun and exciting VFR arrival. John feels he is now ready to fly his Sonex to Oshkosh next year and I agree. The weather was great on Wed. and Thur. for walking around and looking at beautiful airplanes and visiting with venders. I could go on and on about White Knight or seeing the Global Flyer fly. I could talk about the warbirds or watching the daily air show or having Harrison Ford wave at me, say “hi” and ask how Sandy and the kids are doing. Don’t believe that last sentence – it’s just a little Irish blarney. I fell in love with a kit airplane called the “Tundra” which resembles a Cessna 180. It is featured in the Aug. issue of Sport Aviation. Now I need to figure out how to free up a few hours each day for the next few years, so I can build it. Maybe I can forgo sleep. Heck, my kids are home from college and I don’t get much sleep anyway. Wouldn’t they be surprised if they came pulling into the garage at one in the morning to find me out there working on an airplane. I enjoyed the evening visits with chapter members at the chapter tent in Paul’s woods. I want to thank Jeff and his parents for reserving the great site and having everything set up and ready for our members. John and I delayed our takeoff on Friday morning by an hour or so to let some IFR ceilings dissipate over central Wisconsin, but once underway it was a most enjoyable ride home. When it comes to AirVenture awards, the chapter did very well again this year. Jeff Coffey and our chapter web site came in third place. What a great showing for our first year web site. I want to congratulate Jeff and also thank Jon Cumpton for pushing the web site idea. Don Eide, his daughter Sarah and her husband Jim Maloney won the “Judges Choice” for their L-4J. 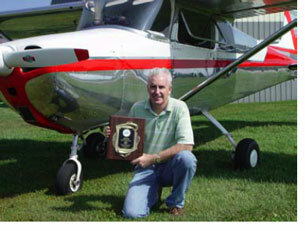 My Cessna won “Outstanding Cessna 170, 172, 175″ for contemporary aircraft. Even though we did not enter the newsletter contest, because we won it last year, we were awarded honorary-SECOND place. Just kidding. Today I had the privilege of talking to one of the Tuskegee Airmen, Mr. Ken Wofford. He has agreed to be our guest speaker for our awards banquet on Oct. 9th. Not only will chapter members enjoy listening to him talk, I think our spouses will enjoy it also. You won’t get too many chances to listen to a firsthand account from one of these gentleman, so check out page 3 and get your check to Ron Oehler soon. We may have a chance to set up a Chapter 25 booth at the Great Minnesota Get Together. Of course we would need volunteers to man the booth during the fair, so I’ll keep you posted as this unfolds. Don’t forget about the raffle – the drawing will be held at the awards banquet on October 9th. Please bring your stubs and money to the next meeting or mail them to Jon Cumpton. Wishing I looked as good as my ’57 Cessna. We all know how excited kids get when Christmas day draws near. Well, the adult version of Christmas is almost here, AirVenture 2005. With SpaceShi- pOne, White Knight and Global Flyer appearing at Oshkosh this year, I would think this is one year you would not want to miss the event. Every year there seems to be an aviation story that stands out from all the rest, but this year there is not one, but a number of events. This should make for an outstanding show. I really hope a lot of our chapter members can make the pilgrimage to AirVenture this summer even if only for a day or two. I know I’ve written before on how lucky we are to live so close to Oshkosh, but I feel it bears repeating. A one day trip in a single engine airplane or a drive with an overnight stay is a very simple undertaking from the Minneapolis area. With a small effort on your part, you’ll enjoy the experience of AirVenture. If you can take along someone interested in airplanes (flying or building) who has not yet attended AirVenture and share the experience with them, you’ll really enjoy the event. I remember different years taking along my wife or kids, father-in-law or a good friend and I can still recall how overwhelmed they were with the size of the event and the number of airplanes. Maybe this is the year you take a neighbor, co-worker or family member and get them hooked on flying. Speaking of flying, I made it to Canada in June for a little fishing and floatplane flying. We caught some walleye, northern and lake trout (nothing big), but enough for a great fish fry one evening and a few to bring home for the grill. If you like fishing, boating and flying you need to try a Canadian floatplane fishing trip at least once in your lifetime. Another fishing trip is being planned with my son Kevin for a 4th of July departure to Alaska for halibut and king salmon. We need some more smoked salmon for Dan Carroll’s Christmas party next December at his hangar. (Now that’s what is known as fishing for an excuse to go fishing). For those members not at the last monthly meeting, I would like to let you know we’ve started a fund for a bronze plaque on the EAA Memorial Wall at Oshkosh for Earl Adams. The plaque’s dedication ceremony will be held during AirVenture 2006. Earl’s wife and son (Clay) who were at the chapter picnic in June are very touched that the chapter has thought to do this in Earl’s memory. It gives me great pride to be your chapter President when you decide to do such a wonderful thing for a member who gave so much of his time to this chapter. Please send your donation to Ron Oehler or give it to one of the officers during a chapter function. Don’t forget about your ten raffle tickets you have to sell (or buy?) during the summer months. Jon has informed me that he has already received a fair amount of books back with all the tickets sold. Thanks! I’ve just been notified or chapter website has been voted one of the top five EAA websites. Congratulation to Jeff Coffey and everyone who has helped him with the beautiful website. The winner will be announced at Oshkosh on July 30th. Good luck Jeff. It is with great sadness that I inform you of the passing of Don Eide’s wife-Ellen. She was always at the chapter functions helping out and she will be missed by us and certainly by Don and his family. I know it will be difficult for Don, but I shared the DC-9 cockpit with Don on many occasions and I know what a strong individual he is, so with our thoughts, prayers and love of family, he will make it just fine. God Bless all of you during this Fourth of July weekend. It’s official, we now have a hangar committee. Lee Hurry, Harv Havir, Ron Oehler, Ed Hansen, Dale Johnson and Ron Hoyt have agreed to be responsible for keeping the hangar in order and doing projects that we feel will make the hangar a better meeting place for our chapter. They need your help though. They are not our mothers, so please pick up after yourself and don’t bring things to drop off at the hangar until you get approval from one of those fellows. We want you to feel pride as you walk into the hangar. We don’t want it to look “junkie”. They recently installed some shelves on the south wall and they are looking at adding a hinged board to the front/bottom of the mezzanine. It would be painted white, so we could use it as a video screen. Craig Nelson’s employer donated a projector, so now we have a projector and maybe a wood screen without having to pay an arm and a leg. Thanks to a few, the whole chapter will benefit. During our June monthly meeting and at our annual chapter picnic the following Saturday we will be passing out this years raffle tickets. The raffle is identical to last year in that you will be getting ten tickets that sell for $5 each. I hope I can count on each member to sell or buy their ten tickets. I talked last month in my column about how we use the raffle money for scholarships and summer camps, so I ask each member to take this challenge seriously and do your part. The drawing will be held at our awards banquet on October 9th. I’ll write about AirVenture 2005 and how excited I am about it in next months column, but I did want to give you a heads-up about making your plans to attend the flyin and especially making room reservations at this time. A month from now all the hotel and dorm rooms close to OSH will be taken. If some of you want to share a ride, hotel room or camp site let one of the officers know and we can put some information on the website and get people together. Now for the $100 question; who won this years Indy 500? Was it Danica Patrick, Dan Wheldon or Patrick Halligan? It was not Danica, even though she was the first women to ever lead the 500, she finished 4th. It was not Patrick Halligan, he just talks 200mph. It was Dan Wheldon from England. It was a great race and we had a wonderful time. In the past month I had the privilege of giving an airplane ride to Sean Clarke and sitting on the committee that chose Noah Lorsung as the student we will send to the EAA summer air camp. Sean is the Lakeville High School student who won our chapter’s college scholarship. I will be presenting him with his $500 scholarship on May 19th at the Lakeville award ceremony. Not only did I give Sean a ride, but also his mom and younger sister. Peter Denny says we made an excellent choice by picking Noah to attend the air camp. Noah will give a full report to the chapter when he returns from Oshkosh later this summer. These are just a couple of the perks that being your chapter president has allowed me to enjoy. I really do feel a great deal of pride representing the chapter during these activities. Last years scholarship winner, Kevin Blendermann, just sent me an e-mail to say “thanks” as the money helped pay for his private license. He has had a great freshman year at UND and he will write an article and send some pictures when he finishes finals next week. By paying your yearly dues you keep the chapter’s day to day operations running smoothly. The members’ airplanes in our hangar help pay off our mortgage and the raffle gives us money to make scholarships and summer camp available to young aviators. I would be remiss not to mention our newsletter sponsors, whose continued support has been outstanding. It is a team effort that keeps this chapter moving (flying) forward. Without your support none of this would be possible. I THANK all of you, for everything you do to make my job easier. We just held an officers meeting in early May and by the time the drinks were gone and the excitement over (drinks were coffee and pop, the excitement – a Boston cream pie) we had covered a lot of topics in two hours. We talked about the raffle, young eagles, scholarships, chapter picnics, private pilot ground school, the hangar, EAA work weekends, and …blah, blah, blah. We even talked about a toilet for the hangar…blah, blah. BLAH. The bottom line is we are trying to make sure we have a little something for everyone. I know everyone has a busy schedule that makes it hard to volunteer and/or participate in all our functions, but do try and mark your calendar in advance and bring a friend or family member to the chapter functions. For the people who do all the work setting up a monthly meeting or chapter picnic, it is very rewarding to see fifty people attend as opposed to twenty or thirty. This year’s chapter picnic will be held on June 18th at the hangar. Watch the newsletter and website for more information. We will also be kicking off our raffle/fund raiser at the picnic. The raffle will be a lot like last years. You may recall that last years raffle was simpler and low keyed compared to the previous years, but we will still need everyone’s participation to make it a success. Later in this newsletter you will see an ad for my airplane (picture above) and I’m sure some of you will be wondering why I’m selling N7252A. I thought I better say a few words to stop any rumors before they start. My plan is to look for a floatplane after I sell my C-172. My current airplane would not work well on floats and it would be too expensive to change. (bigger engine-float kit etc…) If you know of any good C-180 or 185′s, let me know. I want to thank Jon Cumpton for running some of the chapter meetings lately and writing last month’s column. My schedule got a little busy with my annual check ride, four and five day trips and a wedding anniversary. My wife Sandy and I celebrated number twenty-five. I like to think of it as being married for one fantastic year and then just repeating it twenty-five times. That way every year is like a honeymoon. Hope to see all of you at the hangar this summer.